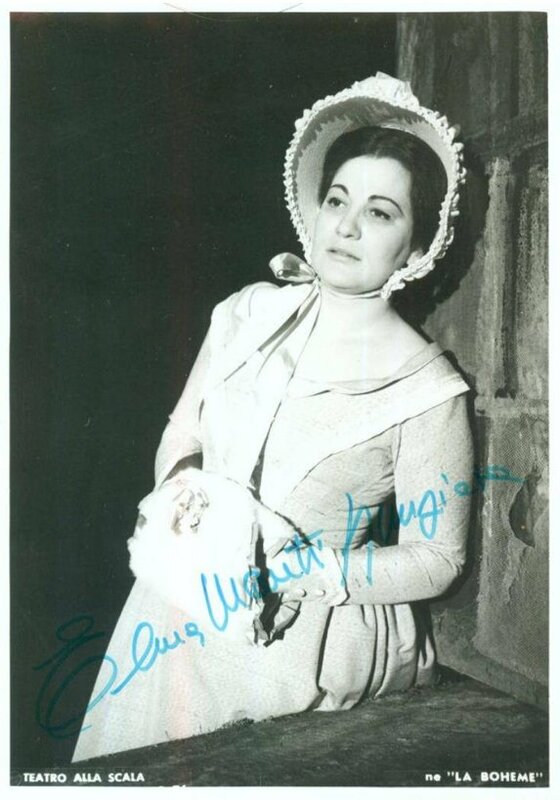 Elena Mauti-Nunziata Interview with Bruce Duffie . . . . . .
Elena Mauti-Nunziata studied in Naples and made her operatic debut in Palermo in 1965 as Liù in Turandot. Since that time, she has sung many performances as Mimì in La Bohème and Cio-Cio-San in Madama Butterfly, as well as the title role in Turandot. She now looks forward to singing Manon Lescaut and also Tosca (“in a few years.”) Besides all this Puccini, she has also given fine performances as Violetta, Marguerite, Leïla, and Nedda in many of the world’s leading opera houses including La Scala, Covent Garden, The Met, Paris, and Hamburg. 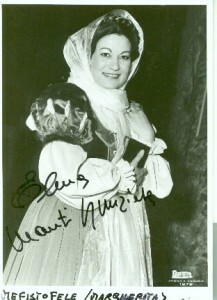 Her American debut was in Dallas as Elvira in I Puritani. During her stay in Chicago for Butterfly, the soprano was most gracious to spend time one afternoon chatting with Opera Scene. Her husband was also there and made several interesting comments, and several times everyone present – the singer, her husband, the interviewer and the translator – were simply roaring with laughter. My thanks to Marina Vecci of Lyric Opera for providing the translation. Here is some of what transpired on that delightful afternoon……. Bruce Duffie: Where is opera going today? Elena Mauti-Nunziata: I hope that opera is going in the right direction. It is going toward the younger generation, and therefore it will have a brilliant future in the same way that is has a brilliant past. BD: Is the future as bright as the past? EM-N: My answer is somewhat egotistical because I hope that the future is much more brilliant! Opera in the past was just for a few privileged people, but in the future opera will be for everyone. BD: Is opera not for everyone today? EM-N: Today opera is going toward the larger audience. BD: Does opera belong on the television? EM-N: Personally I don’t like opera on TV, but the audience has a different taste. BD: Have you appeared on the tube? EM-N: Yes, I’ve done Traviata, Turandot, Pagliacci and a few concerts. BD: When you’re working in front of the camera, are you conscious of it or do you just play to the audience? EM-N: No, I don’t take into consideration the cameras. I just sing to the audience. BD: Does the size of the house make a difference to your performance? EM-N: I am worried up until the time I sing my first few notes, and then I immediately realize what type of house it is. The production of the voice does not depend on the largeness or smallness of the house, but on the vibrations in the voice itself. BD: So it’s the same for you in large houses and small ones? EM-N: I sing the same in the Arena in Verona, which is a tremendous open-air place, as in the Salle Garnier, which is so small that you can hardly call in a theater. BD: Tell me a bit about your current role – Madama Butterfly – do you approve of Mr. Prince’s ideas, and do you alter your conception of a role because of the production? EM-N: I very much approve of new concepts – for instance, this Hal Prince production of Butterfly which is sort of a cinematic style where things keep moving. I also like the transformation of Butterfly herself. The exterior change is the least important – the most important change is what occurs inside as she becomes an Americanized woman. This is very close to my own view of the role. BD: Do you become Butterfly, or are you still Elena Mauti-Nunziata playing Butterfly? EM-N: When I step onto the stage, I become the character – there is no more Elena while I am singing. 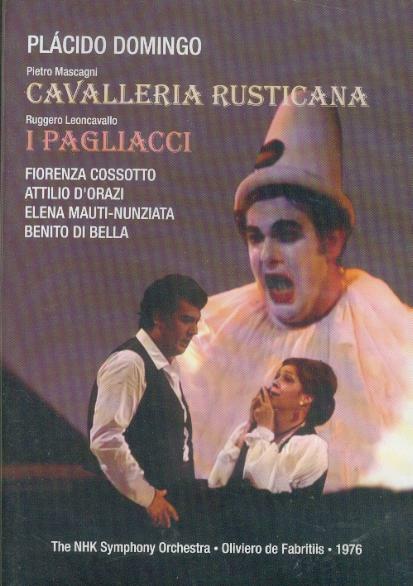 If you remember the Rigoletto here a few seasons ago, or if you have seen me in other operas, you can see that I change radically according to the character that I have to play. For me, that is the only way to perform. Otherwise it would be very hard to interpret it vocally. BD: Are any of the characters you play too emotionally draining for you? EM-N: Butterfly is one, and also Traviata. These are roles that drain me physically and also spiritually as well. BD: How long does it take you to recover? EM-N: Luckily I am a very calm person, so I am regenerated quite easily even after a very exhausting performance. This is why, though, I don’t go to parties or social events after a performance – I simply don’t have the emotional strength to give to it. BD: Does taking curtain calls after a performance break the spell for you? EM-N: I think the curtain calls are a duty that the artist owes to the public. I do object which a colleague bows in the midst of a performance – perhaps after a big aria. That interrupts the continuity of the show. BD: What about curtain calls after individual acts? EM-N: To be very honest, I missed the first-act curtain call in this Butterfly production. I see the curtain calls at the end of the acts as a meeting-point between the artists and the public, where we all communicate what we thought of the preceding performance. BD: So it doesn’t break the spell, then? EM-N: There is already a break because of the conclusion of the act so the curtain calls are a reasonable ending. Then everyone gets re-charged again for the following act. BD: How long does it take for you to get into character? EM-N: I am all for concentration in a character, but I don’t think it’s necessary to spend three or four hours getting prepared and thinking about a character before a performance. I come to the theater very early, but not three hours before. It only takes me a short time to concentrate and get into the character before going on. BD: Does that concentration carry you through the intermissions? BD: Are there places where the intermissions are too long? BD: Are they too short? EM-N: Almost always! In this production, the one break is a bit longer than usual, but that is because there is only one rather than the usual two. BD: Do you do Traviata in three acts or four? EM-N: It really depends on the physical production and whether the producer can solve the problems. In some places I’ve done it in three pieces, and in others there have been four. EM-N: No, not “Poor Verdi” because he was the one to be nasty to the singers. BD: Did Verdi ask things of the singers that are impossible??? EM-N: Well, if Verdi wrote it that way, it must have been possible in those days to sing it that way. So there is no reason why it shouldn’t be sung that way today, except that it does require a little bit of an effort. Husband: In those days, the pitch of the orchestra was lower, and there were fewer dramatic needs to be taken into account. Now the orchestra is higher in both pitch and volume, and the public expects you to attend much more to the dramatic aspects. So it is heavier to sing Traviata today. BD: Are you happy that opera is more theatrical today? EM-N: Oh yes. I am very happy about that because I love the character first and foremost even before the singing part of it. The exploration of the character is one way of approaching the public in a more direct way, making it more understandable. BD: You’ve said that you enjoy new concepts in staging. Are there some productions that go too far? EM-N: I’ve seen examples of productions which went a long way beyond the tradition, including a couple at La Scala. But what is important when doing things that depart from the tradition is to do them with a great deal of intelligence, in which case even though they are different they are very well accepted and they work very well. A good example of that would be the Butterfly I did at La Scala which is very different from the traditional style, but a very beautiful production. BD: How is it different? EM-N: There was no bridge and no flowers. It was a lacquered platform with a tall cylinder that enclosed the platform and nothing else but a sort of veil around the cylinder. All there was, was Butterfly talking to some puppets. You might laugh at this description, but the concept of the director was that no one in this day and age would believe that a girl, however young, would believe the “line” from Pinkerton. So the director was showing Butterfly living in a world of her own making, and all the characters that enter into it are creatures of her imagination. They’re not real – it’s all a fantasy. But this is enough about the other Butterfly – there is so much of interest in this one here in Chicago. It is very beautiful and it fits with my own concept. Mr. Prince and I were able to work together very well without any disagreement – it was a perfect communion of thought and of work. BD: Did you bring any of the concepts from other productions with you to this one? EM-N: Of course I brought in things I’ve learned while doing the role so many times – not so much in terms of entering from certain directions or the like, but rather things having to do with attitude and gestures. Often, when seeing what I was doing with certain lines, Mr. Prince would agree that it was the right thing to do, so I would go ahead and continue doing it. As I mentioned before, it was a communion between myself and Mr. Prince, for although I brought in gestures and other details, he immediately recognized them as being pertinent to the character. It’s also possible that I might have been anticipating some of his ideas. BD: Is this the mark of a great director – the ability to take what the performer brings and mold that rather than forcing a pre-conceived idea on you? EM-N: Yes, undoubtedly. That is the basis for a good performance. I’ll give you an example – I was doing I Puritani in Palermo, the production by Zeffirelli. I was very young then, and when we met, he looked at me and said, “Remember, you are a noble woman, so you’ve got to laugh, cry, love and be crazy, but bear in mind that you are a noble woman, noble by birth.” After that, we did the opera with only two rehearsals. He, of course, gave me the indication of what he wanted, but then let me do the work of interpreting his intentions. We’ve worked many times since then and never had any problems. BD: Now when you do I Puritani in another theater, do you remember what Zeffirelli taught you and ignore the other director? EM-N: No, because I did do it in Dallas and the director was Lotfi Mansouri, another wonderful director. [See my Interview with Lotfi Mansouri.] But I did bring the same spirit to the character of Elvira and it worked out very well. BD: Very well but very different? EM-N: I think it was similar in both Palermo and Dallas, although some of the outer aspects where a bit different, the spirit of the opera was the same. The movements were different because of the different settings, but the inner spirit of the character was the same. BD: Would it be correct, then, to say that you get the spirit of each role from the best director you work with, but the movements change from production to production? EM-N: Yes, and intelligent directors understand that and will let me work with these fine ideas and not try to do anything against them. BD: Have you ever had the misfortune of getting a “hack” director? EM-N: Sometimes it is hard to discuss things or try certain things with various directors, but I always try to find a way to make an agreement with whomever the director is. I don’t like to do something that is not what the director wants, but when it’s all said and done, I am the one on the stage in front of the public and director is backstage? BD: Will you remember a lot of the things Hal Prince taught you in this production and carry them into your next Butterfly? EM-N: Certainly because I’ve never seen a Butterfly that was as truly Japanese. Puccini had never been to Japan and didn’t know exactly all the details, so it was not basically Japanese in concept. But even in earlier productions I would change my gestures in the second act to become more American. In this production, though, the change is much more marked. Japanese women tend to hide their hands, and now I will try to not hide my hands at all in any the second act to show the change in Cio-Cio-San. Husband: Of course the Japanese are so tiny and subdued, and the music Puccini wrote is so strong and big that it doesn’t describe a typical Japanese woman of that time. Already you have indications of how to play her. BD: Does that present inner conflicts – the character fighting the music? EM-N: No, for me there is no conflict because I way interpret Butterfly is not so subdued and tiny. But I change my gestures anyway from the first to the second act. The first is a traditional Japanese woman with the gestures of that culture, and in the second the gestures become much broader because she is much more of a woman. One reviewer here said something that was quite correct – that at the end I killed myself not for love but for vengeance. Butterfly kills herself out of spite, and I’m glad that the reviewer saw this in my performance because this is what I wanted the audience to see. BD: [With a gentle nudge, knowing that he is sitting right next to her at the moment] Would you not die for your real-life husband? EM-N: I don’t know – I’d have to be in the situation and see how I felt, but I certainly wouldn’t kill myself if he went away for three years. Last spring I did a contemporary opera by Mannino called Vivi and it has the same plot as Butterfly. She’s not Japanese but it’s about a woman who loves a man who leaves her and he promises to come back, and he does but with a wife. So in this opera, the woman buys a gun and shoots the man dead! He was so happy after so many Butterflys to see me portray a different ending to this situation! BD: Would you shoot Pinkerton if the director staged it that way? BD: So you enjoy that character? BD: Are there any characters that you portray onstage that you don’t like? EM-N: When I first look at a new role, I study the point of view of the character even before I look at the music. I always interpret characters that I like or at least can sympathize with. BD: Do you turn down characters that you don’t like? EM-N: I am about to sing Don Giovanni and I was originally asked to sing Donna Anna, but I told them if they wanted me in that opera I would sing Donna Elvira. But now I will be involved in another contract where they already have an Elvira, and since I like to sing Mozart every once in awhile, I will sing the Anna even though I’m not really happy with the character. But now that I’m studying it, I’m preparing it a bit differently than what is usually done. BD: So it’s almost like an exercise in discipline to do this character you don’t care for? EM-N: Well, I’m trying to find things that I do like in that character. When I propose these ideas to the director, if he likes the ideas then everything will work all right. BD: Perhaps like in Vivi you can shoot Giovanni! EM-N: Yes, I would definitely approve of that kind of ending! EM-N: Actually I’m really not a violent person – perhaps I’m too meek at times. I’m given to extremes of behavior. I’m either one way or the other way, and it’s hard for me to deal with people who would trample over me. BD: You’re very lucky that your husband can travel with you. Does he accompany you all the time? BD: Do you find it difficult to play a love scene when your husband is in the audience? EM-N: Not at all because life is one thing and the theater is totally different. BD: Are you a tenor or a baritone? Husband: I am a baritone – true men are baritones! BD: Which role have you sung more than any other? BD: Have you sung it too much? EM-N: One can never sing too much a role for which one has a lot of affection. BD: Even if you sang nothing but that one role for a couple years? EM-N: I wouldn’t get sick of it, but the character would certainly suffer from doing only the one part. BD: So you need a balance? EM-N: Well, last year I sang 36 Bohèmes, and the last few became a little too automatic. The gestures and bits of stage business were getting too routine. BD: Is there anything you can do to inject a little life into those last performances, or do something to throw your colleagues to have them do something to you? EM-N: There are always different performances from one night to another. People do slightly different things all the time, but I must react to whatever happens on the stage. Despite doing the same gestures, the spirit of the moment can affect the attitude in which the gestures are done. BD: How much does daily life affect that nights’ performance? EM-N: If someone is sensitive, the daily life does have an influence on your performance. If you have a fight with your husband or with someone else right before coming to the theater, it will have an effect on how you do certain things. BD: Are there some roles you are looking forward to that you’ve not sung yet? EM-N: One that I’ve always wanted to do that I will have the chance to do soon will be Manon Lescaut, and in a few years I would like to sing Tosca. BD: Are you pacing your career carefully? EM-N: Yes. I’ve been careful so far. 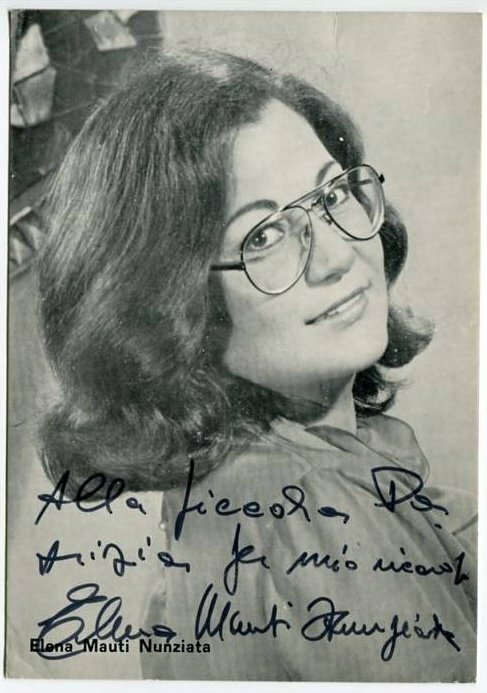 We know that there is a lack of lycico-spinto sopranos – which my voice seems to be – and the attitude of theaters toward me has changed. Before, I was always asked to sing lighter roles, and now I’m getting asked to sing heavier roles – Ballo, Trovatore, Manon Lescaut, Tosca, Boccanegra, Luisa Miller, Don Carlo. For a couple of years I held back and didn’t accept those roles, but now I am beginning to say yes to the ones that I think are suited to my voice. I’m entering that repertoire, but very carefully. BD: Do you enjoy being booked so far in advance? EM-N: It gives me a great sense of security from an artistic point of view and also from an economic point of view. It’s nice to know that I am wanted. BD: Have you made some recordings? EM-N: No. There are some “pirated” recordings but I’ve not done any in the studio. My I Puritani from Dallas and the Turandot from La Scala are around. BD: Are you frustrated that you’ve not been asked, or is simply the lack of time? EM-N: I’m mad about it. Not frustrated, but a bit angry. In some roles, I think I have more to offer than some singers who are constantly doing recordings, but I have found it hard to penetrate the recording circle. Of course doing or not doing recordings has a lot of influence on your career as a whole. I have to prove myself every time I perform. There are no “examples” to prepare the audience. Besides not making records I don’t have a press agent to do all of the details for me. BD: But can’t recordings be too perfect? EM-N: They tend to be very cold because we all know how they are made – cutting and pasting the best sections together. Some singers who have no high notes will have them on the record and people with no voice have a voice on the records. I am quite happy with the appearance of “live” recordings which mike much less. BD: Are you happy, then, that some of your performances are out on pirated discs? EM-N: I am happy that even if I don’t make any commercial discs, at least there will be the pirated recordings to remember me by. BD: You’re moving more into Verdi now? EM-N: I don’t think of myself on the whole as a “Verdi voice” but there are a few roles of his that I sing – Traviata, Otello, Trovatore, and in a few years Don Carlo. But that’s it as far as the Verdi roles for me. BD: Have you ever sung any operas in translation? EM-N: I’ve done a few French operas in Italian, but also I’ve sung them in the original French. EM-N: No. For instance, I’ve sung Manon by Massenet in both French and Italian and it’s completely different in the translation. The accents and the whole musical line are different. BD: You don’t find a closer contact with the audience when they understand each word? EM-N: Yes, but the libretto is available, and before coming the people should buy the libretto and read it. BD: Is the public more prepared today than it was some years ago? Husband: Toti Dal Monte was a famous Butterfly, but I don’t think she could have done well in this production. BD: Is that because she was from a different age? BD: Do you think that people will accept this Chicago Butterfly 25 years ago from now? EM-N: Probably because this production is very modern and will last. It came out of the tradition and extended that tradition to a new level. This, of course, is my own opinion and there are all kinds of people with all kinds of opinions about how Butterfly should be done. EM-N: I hope to return before another six years have elapsed. BD: When a house asks you for a role, do you then wonder if that is the direction you are going? EM-N: Yes. For instance, when they first asked me for Tosca I said no, but decided that perhaps in three or four years I ought to do it. So that started me thinking in that direction. EM-N: My husband is the one who is called, and when he’s on the phone he will speak in a voice so that I can hear what is being discussed. So I’ll nod my head or shake my head to let him know if I want to do that role. It’s easier for me to let him turn things down. BD: [To Husband] Do you like being her agent? EM-N: [Startled] This is a true confession for I’ve never thought he didn’t like it. I try to be as normal as possible in my private life. Most people outside don’t recognize me as being an opera singer, but despite that I do have a bit of artistic temperament and I get moody once in a while. This can make things difficult for people who are close to me, so perhaps it is difficult for him to be so close to me emotionally and still function as an agent. BD: Are opera singers in general “normal” people? EM-N: Generally speaking, opera singers are not really normal people. There are exceptions – normal people who have beautiful voices – but mostly they are singers from top to bottom, and that is quite a tragedy. BD: They only live for their art? BD: One last question – are you good audience? EM-N: Yes. I have a great enthusiasm and take part in what happens on the stage. If the artist gives a lot, I will give a lot back. It doesn’t matter if there is a minor flaw, but rather how the overall performance is. BD: Thank you for coming to Chicago. EM-N: Thank you and thanks to all the listeners. I am happy in Chicago, and I will be happy to come back again. Arrividerci, and I hope it will not be another six years before I return. This interview was recorded in a dressing room backstage at the Civic Opera House in Chicago on November 22, 1982. It was published in Opera Scene Magazine in January, 1983. The transcription was re-edited, photos and links were added, and it was posted on this website in 2013.